CANNIBAL CORPSE - GLOBAL EVISCERATION (DVD DIGI) | Online Shop | Wizard LTD. Album: "GLOBAL EVISCERATION (DVD DIGI)"
stuff from their Evisceration Plague 2009/2010 world tour! For over 20 years CANNIBAL CORPSE are leading a whole genre! 20 years of no compromise – 20 years of captivating shows in front of over 1,200,000 fans and over 1.300.000 records sold and 20 years of problems with censorship! 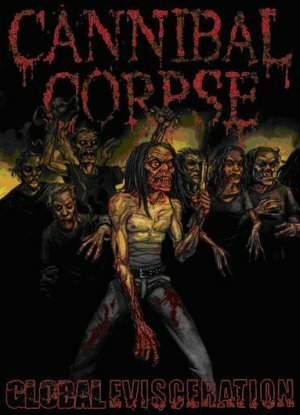 Cannibal Corpse is the most successful Death Metal Band ever! With „Global Evisceration“ Cannibal Corpse documents on of the most controversial time in the bands history. “Evisceration Plague” was banned in Germany, Shows got cancelled due to offence lyrics and the band played in countries where it wasn’t possible before. The DVD features 2 of the best Cannibal Corpse shows in the past century, filmed in Albuquerque and Englewood. Beside their well-known hits like „Hammer Smashed Face“ or „Stripped, Raped and Strangled“ the fans also gets actual band hymns like „Evisceration Plague“ 1st time on DVD. Between the songs Fans will find a well done documentation of the bands travels, likes, dislikes, failures and other fun stuff from the road. A true highlight is “18 European and Eurasian countries in 10 days”! As usual with Cannibal corpse you will get a truly unique packaging, done once again by Vince Locke. Over 3h of music, behind the scene footage and Bonus Material of places the band has never been in their 22 years of existence, banned on DVD over the last 2 years. A true must have for all fans of extreme music and of course Cannibal Corpse devotees! !